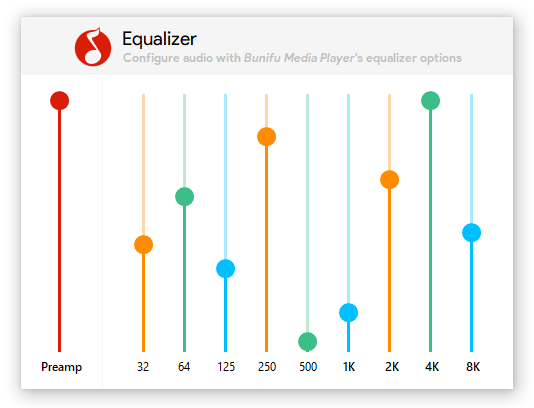 Create awesome experiences with value-range selections both horizontally and vertically using Bunifu Sliders. Bunifu Sliders are functional and rich UI controls that let you select values either horizontally or vertically that occur within ranges, for example, in Volume control, Industrial machines' interface control, value adjustments in Application Settings such as changing the Form's opacity, adjusting the size of text and/or images (zooming), and more. Sliders can be used in a really wide range of application areas. A handy Bunifu Media Player using Bunifu Sliders and other controls. Bunifu Sliders come bundled as two: BunifuHSlider (Horizontal Slider) and BunifuVSlider (Vertical Slider). They are both similar in their look, feel, and features with the only difference being their orientation. Bunifu Sliders have two movement options: Incremental and Instant. You can toggle the movement option simply by setting the property AllowIncrementalClickMoves to either true or false. To disable the scroll menu, set the property AllowScrollOptionsMenu to false. This means that you can easily scroll or change values within Bunifu Sliders using the supported keys. You can however disable detection of these keys by setting the property AllowScrollKeysDetection and AllowHomeEndKeysDetection to false. This variety of movements built-in will help create a much better and refined experience for your users and the various use-cases that can be applied. If you're not a die-hard fan of animations, you can always disable scroll animations in any of the two sliders by setting the property AllowScrollingAnimations to false. Customizing Bunifu Sliders has been greatly simplified at design-time. ElapsedColor: Refers to the elapsed or currently passed value-region in the slider. SliderColor: Refers to the standard color of the slider; it represents the unpassed value-region in the slider. ThumbColor: Refers to the color of the movable element (also referred to as the thumb). Maximum - This property sets a slider's maximum scrollable range – the default value is 100. Minimum - This property sets a slider's minimum scrollable range – the default value is 0. Value - This property sets the thumb’s value or position in a slider – the default value is 0. 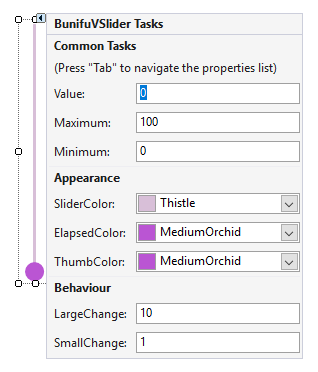 LargeChange - This property sets the amount by which the thumb’s value changes when the user clicks inside a slider or presses the PageUp or PageDown keys – the default value is 10. SmallChange - This property sets the amount by which the thumb’s value changes when the user clicks outside the thumb or presses an Arrow key – the default value is 1. AllowCursorChanges - This property gets or sets a value indicating whether the slider will allow changes to the cursor during the thumb’s movement. AllowHomeEndKeysDetection - This property gets or sets a value indicating whether the slider will allow detection of the Home/End special navigation keys. AllowIncrementalClickMoves - This property gets or sets a value indicating whether the slider will allow incremental thumb movements whenever the scrolling region is clicked at any one point. AllowScrollingAnimations - This property gets or sets a value indicating whether the slider will allow changes to the cursor during the thumb’s movement. AllowScrollKeysDetection - This property gets or sets a value indicating whether the slider will allow changes to the cursor during the thumb’s movement. AllowScrollOptionsMenu - This property gets or sets a value indicating whether the slider will display the scroll menu when right-clicked. ElapsedColor - This property gets or sets a value indicating whether the slider will display the scroll menu when right-clicked. SliderColor - Gets or sets the slider's elapsed region color. ThumbColor - Gets or sets the slider's thumb color. OnDisable - This property provides a list of visual properties that are used to customize the slider's appearance when disabled. These properties include: ElapsedColor , SliderColor , ThumbColor . To access any property, simply type: OnDisableSlider. For example OnDisableSlider.ElapsedColor or OnDisableSlider.ThumbColor. MouseCaptureChanged - This event is raised whenever the mouse has been captured or changed within the slider. Scroll - This event is raised whenever scrolling begins. ValueChanged - This event is raised whenever the Value property has been changed. We're endeavouring to include more features with our upcoming releases. 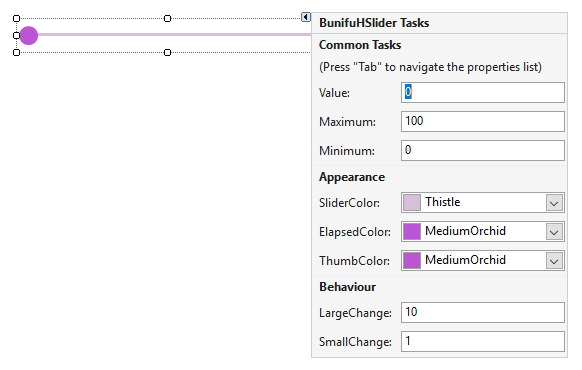 We hope you'll love Bunifu Sliders and do more with them in your Windows Forms applications.